Rebecca Mancino Litke shows pastels, drawings and paintings at the Short Term Gallery...and sometimes you might find her staffing the gallery where her warm smile and love of the arts is shared with everyone who comes to visit. Becky works out of a studio in Haines, Oregon. Born and educated in Detroit, Michigan, Becky's serious interest in art began in the late seventies. A mostly self taught artist, she has studied under several well known artists and instructors. Becky resides in beautiful Eastern Oregon with her husband Bruce who is an avid sportsman and hunter. 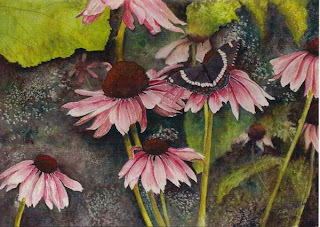 His love of nature has inspired many of her paintings.Becky paints and draws with most mediums such as watercolor, oil, acrylic and pastel. 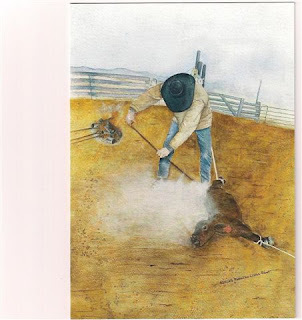 She has painted landscapes, portraits, and animals. Her work has won over 45 awards. She has taught at the Nampa Art Guild, Caldwell Art Association, Purple Sage Creative Arts & the Crossroads Art Center. She currently teaches watercolor & pastel classes at the Crossroads Art Center in Baker City, Oregon. She has been associated with the Paint & Draw Art School in Boise, Idaho, as pastel instructor.